I’ve been hunting hogs since the early 1980s and it has become a passion. I normally hog hunt approximately 250 evenings a year. I have constantly tried to gain knowledge and improve my hunting skills. Some of the most important knowledge I have learned is what makes a good hog weapon. Additionally, being in the gun industry since 1974 has allowed me to use just about every hog weapon available. This experience has given me the knowledge to form some pretty strong opinions on what truly makes an outstanding hog weapon. While I really like my bolt action hog rifles in .308, .30-06 and .358 Win., there are often times when a quick follow-up shot is desperately needed. For that reason I have pretty much gravitated to semi-autos over the past 4-5 years. I have shot hogs with semi-autos in 5.56/.223, 6.8 SPC, 7.62x40WT, 300 BLK, .30 RAR, .308 and .458 SOCOM. I have found the 5.56/.223 and 300 BLK to be lacking in killing power unless you achieve perfect shot placement every time. The 6.8 SPC and 7.62x40WT are noticeably better and normally kill very well if Barnes X bullets are used; however they still fail to stop big hogs in a hurry if the spine isn’t hit. The .30 RAR and .308 work very reliably with good bullets if decent shot placement is achieved, but they still do not offer that extreme margin for error when Murphy shows up with his law! Enter the .458 SOCOM, THE HAMMER OF DEATH for hogs. I have been using the .458 SOCOM shooting Barnes 300gr TAC TX bullets almost exclusively for the past year and a half and I can state without reservation it is the ultimate hog medicine out of an AR platform carbine! So far my .458 SOCOM’s have accounted for over 100 hogs. Fortunately, to date we have not failed to recover a single hog shot with them. 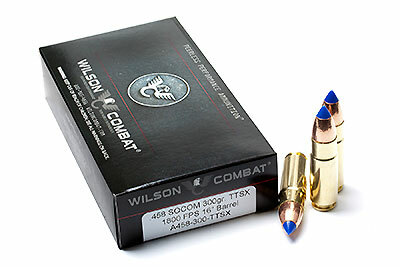 My family’s company, Wilson Combat, has been building .458s for about a year now, gradually improving and tweaking. I have to say we have now gotten them pretty much perfected. Enter the ULTIMATE HOG WEAPON, in my opinion. This combination will shoot 1” groups at 100yds reliably and utilizes one of the best low-light optics I have ever tried. It’s short and light (without the NV attached), something that has become very important to me as I get older. The Zeiss is one of the best compromises between low-light optical quality and size/weight; it’s simply outstanding. I chose the Leupold aluminum rings for their light weight and the fact they mount to the scope at the optimum height to line up perfectly with the PVS-22. There you have it, one man’s opinion on the ULTIMATE hog weapon. Where did this outstanding hog stopping round come from? Would you believe Mogadishu? That’s right, the Mogadishu we know from news reports and the movie “Blackhawk Down”. Yep. Mix beer, steak and analysis of Operation Gothic Serpent and you get the .458 SOCOM round! The .458 SOCOM cartridge was developed around 2000 as a result of an informal discussion with a senior member of the US Special Operations community following the Operation “Gothic Serpent” debacle in Mogadishu, Somalia, described in the book “Blackhawk Down”. In the book (and in private discussions), members of TF Ranger and USSFOD-D comment on the apparent ineffectiveness of the 5.56mm ammunition in their engagement of the assailants, stating that often multiple shots were required to disable a target. These concerns and those of others were formalized in a briefing to the commander of Naval Special Warfare and later studies showed that indeed, from the shorter barreled .223-caliber weapons (e.g. M4 and Mk18), the angle of attack of the bullet could dramatically affect the performance. This discussion (which took place over beer and grilled top sirloin) focused on the possibility of developing a new cartridge capable of providing superior stopping power for AR-15/M-16 based weapon systems. An obvious first candidate was the 7.62 x 39 M43 cartridge that originated in the former Soviet Bloc. As the AR-15/M-16 had already been adapted to fire this cartridge, it seemed a simple solution. To increase the flexibility of the new cartridge, however, the decision was made to increase the bullet diameter to be able to employ heavier projectiles. Next, the case had to be designed. We happened upon the Tromix Sledgehammers in .50 AE and .440 Corbon. These rounds were capable of using bolts of standard metallurgy, resolving the issue of bolt retrofit. However, the magazines had to be altered to accept the “short” pistol cartridge. A case of the same diameter as the .50AE that would fill the AR-15 magazine completely seemed the choice. To offer the greatest flexibility to the user, the decision was made to design the new cartridge in .458 caliber. This gave the user a vast choice of commercially available bullets, ranging from 300 gr. HP and Spitzers, 405 gr. FN, up to 500 gr. Solids and Tungsten Core RN. The use of the Hornady 45 caliber sabot with the 38 caliber 158 gr. JHP used for muzzle loading rifles seemed to be feasible as well (later experiments appear inconclusive, partly due to the fact that the sabot is actually .451 caliber and not .458). This decision was strengthened after a literature search revealed two similar designs, the .458 Whisper and the .458 x 1.5”. Both had been designed to fire the heavy (500 – 600 gr.) bullets at subsonic velocities, and the Barnes .458 x 1.5” briefly saw service in Vietnam in the Special Operations community. First designs used the 8 x 68 S case, as it shares the rim diameter of the .50AE and is non-rebated. Discussions with Tony Rumore revealed that the .50AE and its wide rim posed an issue in that quite a bit of material had to be removed from the bolt lugs to make it work. He recommended against this design, and we went back to the drawing board. The use of a drastically rebated rim seemed the solution, and the 0.473” diameter rim employed by the .308 and .30-06 based cartridges was chosen. This would allow easy retrofit of bolt-action rifles in this caliber. We asked Starline Brass for what was thought to be the impossible: A pre-production run of .50AE brass, but unformed, untrimmed AND with the rim rebated to 0.473”. The .499 L-W project was mentioned to see if it would be possible to “tack on” to their order, but Starline replied that the L-W team had yet to decide on case dimensions and that no order had been put into the system. They agreed to make the SOCOM prototype cases, and soon shipped the initial 2000 cases. Not until AFTER those cases were received did L-W actually send an Email with the “final” dimensions for the .499 L-W. The two main proprietors of L-W soon had a “falling out” and purportedly went their separate ways. Dave Davison, at CH Tool and Die, developed the initial dies. These were sent to Tony at Tromix, along with some initial loads developed on QuickLoad. Initial loads and the overall case were designed around the Barnes 300 gr. X Spitzer, apparently the lightest spitzer bullet available which was thought to offer the best ballistic coefficient. The Lost River 400 gr. J36 offered a better BC, but was far too long to leave enough powder capacity and still function through the AR magazine. Based on Tony’s initial response (“HOLY [email protected]%”), it appeared the SOCOM would do what we wanted it to do – hurl big chunks of metal at substantial velocity from unaltered AR-15 lowers and magazines – in full auto if so desired. 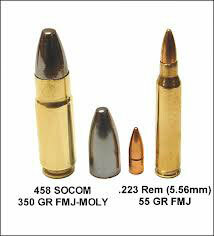 Thus the .458 SOCOM was born, with a 40 mm long case to allow the use of the Barnes 300 gr. X Spitzer and still function through the AR magazine, a rim rebated to 0.473” to allow easy retrofit to existing bolt actions AND leave more material on the AR bolt, and in .458 caliber to allow a wide range of bullet weights. The case is a pistol case operating at relatively low pressure, and thus imparting less stress on rifle parts. The cartridge name, .458 SOCOM, is based on the caliber (obviously) and on the fact that the initial impetus came from those “Beer and BBQ” discussions with our friends in special operations. Also the round was inspired by the Barnes .458 x 1.5” which had seen action in Vietnam in a Special Operations role played a part in naming the cartridge. There you have it. What was originally made to be the ultimate man stopping round may also be the ultimate hog/elk/bear or whatever else stopping round for the AR-15 platform. You should try one out for yourself. Rent or borrow one if you can, or order one from Wilson Combat. Then go look for some hogs. Big ones! This entry was posted in Bill Wilson - Practical Tactical Hog Hunting and tagged .458 SOCOM by Bill Wilson. Bookmark the permalink. I recently got heavy back in to hog hunting again, I have been so passionate about my deer hunting and gotten so consumed with managing my deer and plots year round I truly forgot how much fun it is .. I recently had the opportunity to purchase a 700 Remington in the 375 hh mag cal. What are you thoughts on that caliber? I’ve not had the opportunity to pound pigs with that, but I can only imagine it will be fantastic! Post up on our Facebook page when you have some to show off. Or use the contact form. Maybe we can interview you for a future story!